Two more Republican senators have announced their opposition to the current version of the bill. The newest version of the health care bill doesn't have enough support to be considered on the Senate floor. On Monday night, Republican Sens. Jerry Moran and Mike Lee announced they won't support the bill in its current form. The two join their Republican colleagues Sen. Susan Collins and Sen. Rand Paul in planning to oppose a motion to proceed to consider the bill. Collins opposes the bill in its current form due to cuts to Medicaid. Lee, Moran and Paul oppose the current bill because they say it doesn't fully repeal the Affordable Care Act. Senate Majority Leader Mitch McConnell could only afford to lose the support of two Republican senators to move forward with the bill. Even then, he would need the tie-breaking vote of Vice President Mike Pence. McConnell had planned to tackle the bill this week. 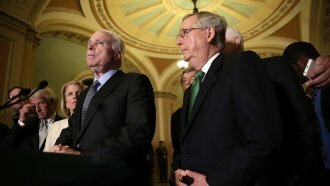 But after Sen. John McCain underwent surgery on Friday in Arizona, McConnell deferred consideration of the bill. He needed McCain's vote to move ahead with it. But now McCain's vote — at least for this version of the bill —won't be enough. President Donald Trump tweeted Monday night: "Republicans should just REPEAL failing ObamaCare now & work on a new Healthcare Plan that will start from a clean slate. Dems will join in!"